Mindy hopes that all teens who are able to will vote in the upcoming election. During the school year, my friends and I often had discussions about current events, like the war in Iraq. And now that most of us are 18, we will be able to voice our opinions by voting in the next election. I’ve always looked forward to being able to influence government policy. With a presidential election coming up this November, I was thrilled to know that I could finally take part in choosing the next president. But before I could vote, I had to register. To find out how to register, I Googled “California voter registration” and clicked on the first government link that came up: www.sos.ca.gov. Since only official government sites can use the “.gov” ending, I knew that this link would be a good place to start. When I opened the page, I saw that it was the California Secretary of State’s website, which assured me the site was a reliable source that was not run by a random organization out to get my personal information. I found that it was free to register, so I followed a link on the website to the online registration form. Any United States citizen who will be at least 18 by the next election is eligible to vote. I was surprised to see how simple the California voter registration process was compared to the countless applications for college, scholarships and financial aid I had to fill out during my senior year. Registering to vote requires only one form, which took me about five minutes to complete. The form asked for basic contact and identification information, including my date of birth, home address and phone number. There was also a section that asked about my political party, where I could choose to be a Republican, Democrat or a decline-to-state voter. I spent a while on this question because I knew that registering for certain parties could limit my ability to vote for other parties’ candidates in primary elections. In the end, I chose to be a decline-to-state voter because I didn’t want to commit to a single party. But this means that I will have to pay attention to changes in state policy before every election. In the general election, however, all voters are free to vote for any candidate. There are three ways to register. I chose to fill out the registration form online, which seemed to be the most convenient option. A week or two later, I received the form in the mail with the information I submitted online. Since the form was already addressed and had pre-paid postage, all I had to do then was sign the form and mail it back to the local county elections office. Another option is to go online, download and print the registration form, then mail the signed application to the county elections office. The last alternative is to pick up the form from the elections office, and either fill it out there or mail it to the office. 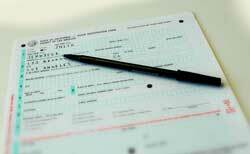 Registration forms can also be found in public libraries and post offices. Once the application is processed, the elections office says that you should receive sample ballots in the mail before Election Day. Registering online worked for me because I registered long before Election Day. You should keep in mind that the state requires all voter registration forms to be postmarked at least 15 days before the election. To be eligible to vote in the presidential election on Nov. 4, you need to postmark the form by Oct. 20. To make sure you meet that deadline, stick the form in the mail by Oct. 19. There are several websites you can turn to for more voter information, but the one I have found to be most helpful was www.sos.ca.gov. Everything I needed was available on this website, which also explained the registration process and answered frequently asked questions (FAQ) about voting. It mentioned that once I was registered, I would not have to re-register unless I changed my name, moved to another address or decided to change my political affiliation. I especially liked this site because it had a link to a list of county elections offices and told me everything I needed to know, like how to find my polling place. I was glad to find that I could also download a vote-by-mail application on www.sos.ca.gov, since I will be out of state for college this fall. I’m excited to know that I finally have a say in what goes on in the country, but registering also left me with the reminder that to be a responsible voter, it was up to me to be knowledgeable about current events. Being an active voter is so important because it encourages you to stay informed, and I hope that all eligible teens take the first step and register. Click here to read Casey’s story about voluteering to be a poll-worker.